One man's journey from a run-loathing, water-fearing, multi-sport dreamer, to a determined age-group triathlete and Ironman. 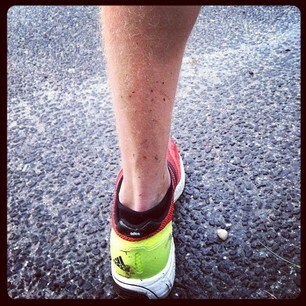 Through a mild (and refreshing) morning rain, yesterday I completed a grueling track workout. It had been awhile since I had been on a track in (lately I've had more hill work than straight speed intervals) and I forgot how fun it is to circle the oval (over and over and over). The workout consisted of a warmup followed by an interval of 1200m, 1000m, 800m, 600m, 400m, & 200m, each followed by a 200m recovery. Coach worked up a detailed time target chart for each interval which had us aiming to increase the pace for each subsequent distance. By now I've completed a variety of speed and hill workouts and this was by far one of the toughest yet. At about 35 minutes long the workout was one of my shortest runs in a long time, but maintaining the prescribed speeds over those distances was super challenging. I definitely began to tire throughout the workout but I was still able to increase my speed and finish strong. I think that what I enjoy most about the track is that it makes me think of how hard it was for me to even run a mile growing up (think presidential fitness test). I was always reasonable fast, but in very short bursts. Through my triathlon training I've been able to build my endurance but also cultivate my ability to run fast. I can't wait to see what's planned for next week! My Other Reviews, Posts, Videos, etc. In September 2010 I participated in my first race, a duathlon in Key Biscayne, FL. I had a blast and was envious of those athletes that had completed the triathlon version of the event. I was determined to do it too; only I couldn't swim and had only been running a few months. I have since completed many triathlons, including two half-iron distance races and one full. This blog tells you how I got here, what I've learned (and am still learning), about training, nutrition, life balance, gear, and all other things triathlon-related. #1: For this blog I rely on my own experiences with triathlon training, relevant literature, and other pertinent information from credible sources. I am not a doctor, personal trainer, dietician, or fitness/triathlon coach; all the information provided here is for informational purposes only. #2: I have a good amount of product reviews on this blog; I buy these products myself and provide the reviews to help out other triathletes. I haven't received any free products or compensation for these reviews. If at any point I begin to receive samples to review I will make this clear in the reviews. Copyright © 2011 A Triathlete's Blog All rights reserved. Writings and opinions expressed on this site are those of the author. © Andrew Zitofsky 2011. All writings and opinions expressed on this site are those of the author. Simple theme. Powered by Blogger.